Flap copy: Everyday a young boy sits for hours on his front porch, watching from a safe distance as large, scary-looking horses plod up the street, pulling the wagons of vendors and collectors for the war effort. Ashamed of his fears, he longs to be brave like his soldier father. But no matter how hard he tries, he can't get up the courage to approach the street horses. Finally, through his search for the perfect birthday present to send to his dad overseas, the boy manages to overcome his fear and take a big step toward growing into a young man who will make his father proud. This beautiful story of love, fear, and sacrifice by Dori Chaconas, brought to vibrant life through the poignant illustrations of Ted Lewin, provides a striking and often heart-wrenching picture of the World War II home front that will touch readers young and old. Behind the Scenes: As a young child in the 1940s, our big front porch became the center of activity in the summer months. By day, it was a playroom, scattered with paper dolls, coloring books, and whatever toys happened to be the favorites of the day. In the evening, the porch became a gathering place for family, friends, and neighbors. Newspapers were read, stories were shared, and there was always an adult lap handy for a sleepy child. We watched the world go by from the safe haven of our front porch, and I especially loved watching the street horses. 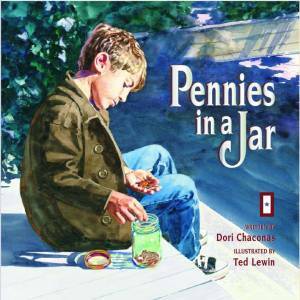 I wanted to capture a bit of those times in story, and so Pennies in a Jar was born.